BHRC has published an open letter to the Prime Minister of Nepal raising concern for the government’s response to the death of 66 people, including 10 police officers in the Terai region of Nepal in 2015 and 2016. The protests began in the final weeks of Nepal’s protracted constitution drafting process. In the aftermath of the devastating earthquake which struck Nepal in April 2015, four major political parties reached an agreement to complete the Constitution by a “fast track” process. Marginalised groups in the Terai region particularly Madhesis, Tharus and Janajatis objected to this “fast track” process and the constitution which emerged from it. They objected to the new federal boundaries and to other aspects of the new Constitution which they claim abrogate previous commitments made to their communities and create “second-class” citizens. Objections include the unequal distribution of parliamentary constituencies and restrictions on the right of women to pass citizenship to their children. The deaths during the protests has been widely reported by national and international organisations, including Human Rights Watch and the UN. These reports include accounts of police violence and use of highly lethal firearms, primarily targeting members of ethnic minorities in the Terai region, to clamp down on protestors exercising their legitimate rights to peaceful assembly and freedom of expression. To our knowledge the UN has yet to receive a response to the questions it posed in its Communication. 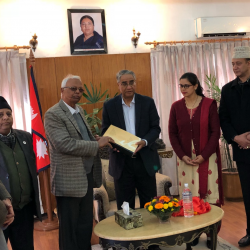 Prime Minister of Nepal receives the report from the Inquiry Commission. The findings have yet to be made public. Since the protests, the Government established a High-level Inquiry Commission with the mandate to investigate the violence, killings, arson attacks and vandalism that took place during protests organized in Terai by various parties.On 15 December 2017, the Commission delivered its full report to the Government and provided a public summary of its work but not its findings. BHRC does not believe the full report has been made public. BHRC’s letter raised concern for Nepal’s obligations under international law to preserve the right to life, as well as freedom of expression and association. further investigations be made and where appropriate prosecutions to be taken against the perpetrators.